Although the production methods and quality of craftsmanship have changed greatly since Subbuteo was launched in 1947, the basic game still remains virtually identical to how it has always been. The low-tech, nostalgic charm of Subbuteo - where players have to 'flick' the pieces to score goals - has made this one of the all-time classic 'board games'. It was so popular in the 70s and 80s that it became a symbol of British youth culture. There having been numerous songs, films and TV shows that have made reference to Subbuteo - and there are even several books dedicated to charting the fond memories that generations of children have had about the 'world's greatest football game'. Despite other competitors entering the market, the fact that players of the game have to control 'real' characters seems to be one of the key reasons children are able to connect with Subbuteo so well. Although parents may see children playing with little plastic figures on the kitchen table, the players themselves can be in a completely different world, where Geoff Hurst has to make it a hat-trick to win the 1966 World Cup Final! All this helps to explain how Subbuteo can stand up to so many plays - and why some of the original sets now demand impressive amounts at collector auctions. 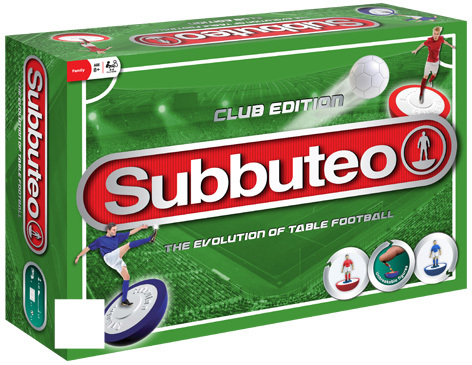 Paul Lamond Games released a revised version of the original Subbuteo, complete with a playing pitch, two goals and balls as well as blue and red teams. Sold in the iconic green box, the Club Edition Subbuteo is as popular with dads as it is with their sons. A separate range of Premiership football teams is also available with flexible bodied players.